He’s a mean one! 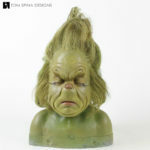 A custom display bust created for a production made Grinch makeup appliance. 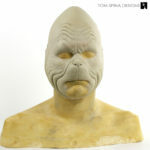 One of our clients purchased this production made Grinch makeup appliance from Prop Store’s Rick Baker Monster Maker Auction (an auction we helped prep for the legendary makeup artist, doing some movie prop restoration and conservation work) and wanted it turned into a life sized sculpture of the character. 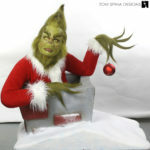 To create the pose and display we took inspiration not only from the Jim Carrey film but also from the original 1966 cartoon. 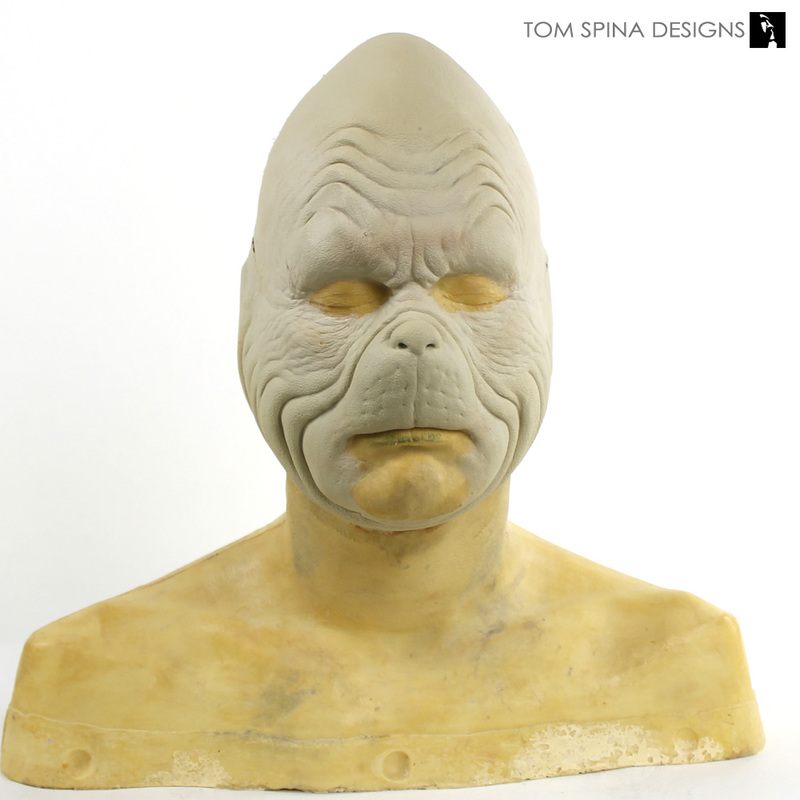 It’s an elaborate display bust for a simple foam latex appliance, and one that required a wide range of our skills. 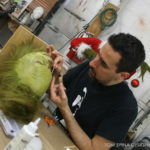 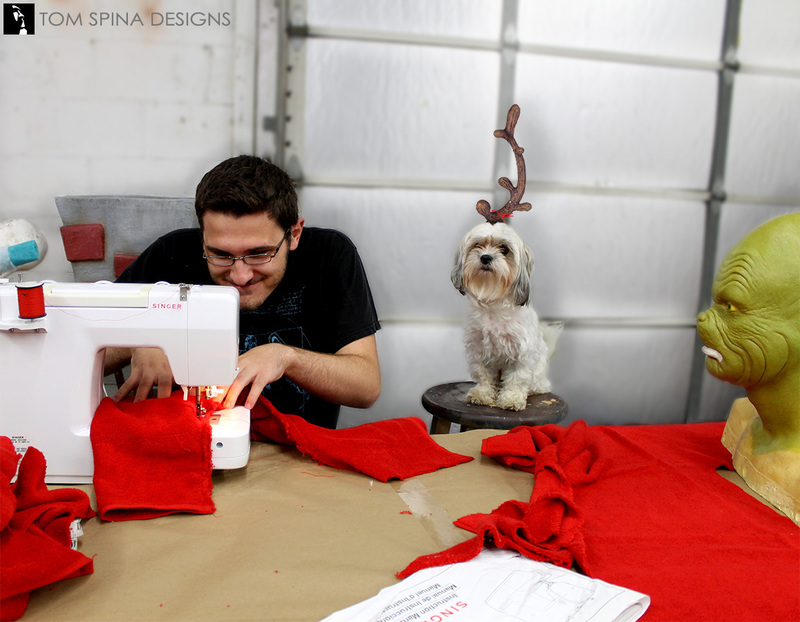 We began by carving out the basic shapes of the chimney, and the Grinch’s body out of EPS foam. 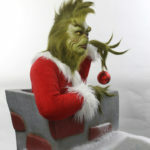 That would all get hard coated, hand painted and have flocking style snow added. 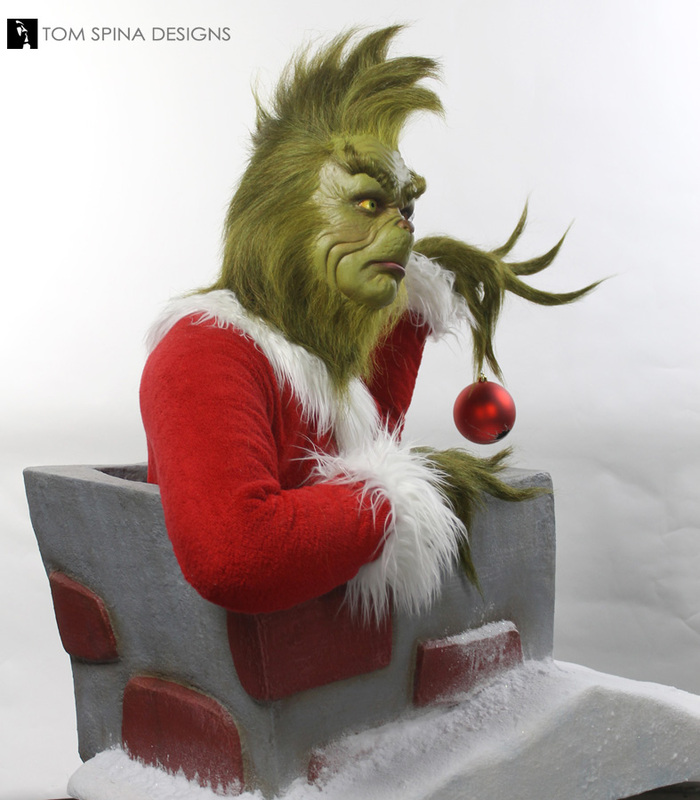 To the life size Grinch, we added a pair of life cast hands which were modified to give the Grinch his elongated, pointy fingers. 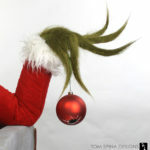 One of the hands takes inspiration from the Grinch movie’s teaser poster, holding a cracked Christmas bulb. 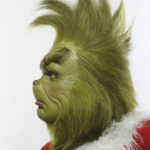 To ensure that we could get a Santa suit which closely resembled the unique look of the film we chose to create a custom one using terry cloth and a shag style fur. 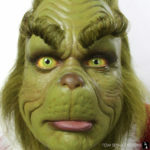 To transform the raw foam appliance into a lifelike Jim Carrey display bust, we began by adding custom acrylic Grinch eyes, sculpting lids in an extreme pose. 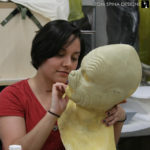 We sculpted a pouty lower lip into the Carrey lifecast, and tried to give the piece a bit of energy, without modifying any of the foam latex production piece. 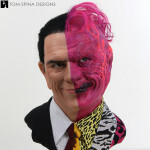 Tom painted the head to match Rick Baker’s studio’s original paint scheme as closely as possible, using layers of green and subtle purple and brown. 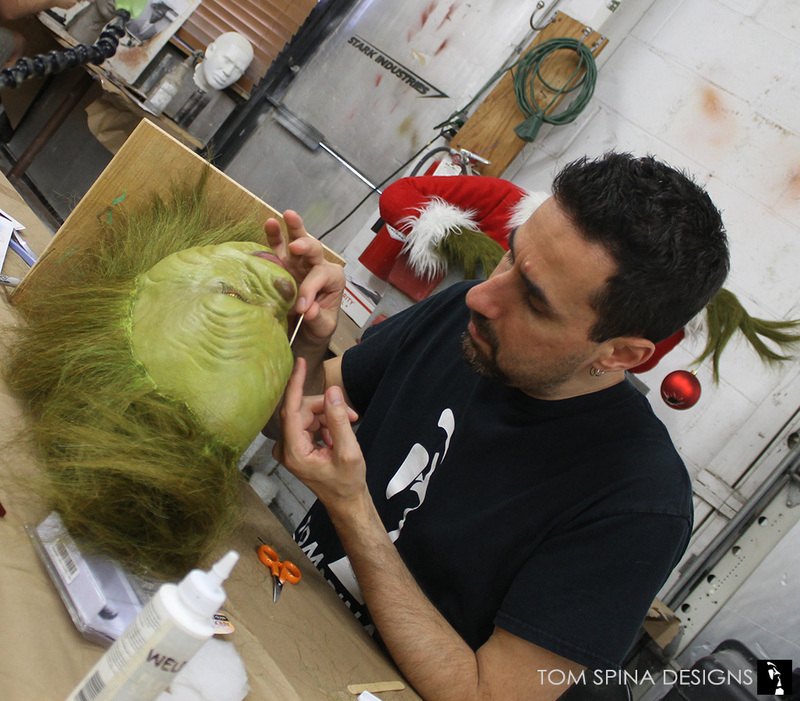 Hours were spent carefully hand gluing layers of acrylic and crepe hair. Custom hair was created for us by our friends at National Fiber Technology who created the actual fur for the Grinch movie. 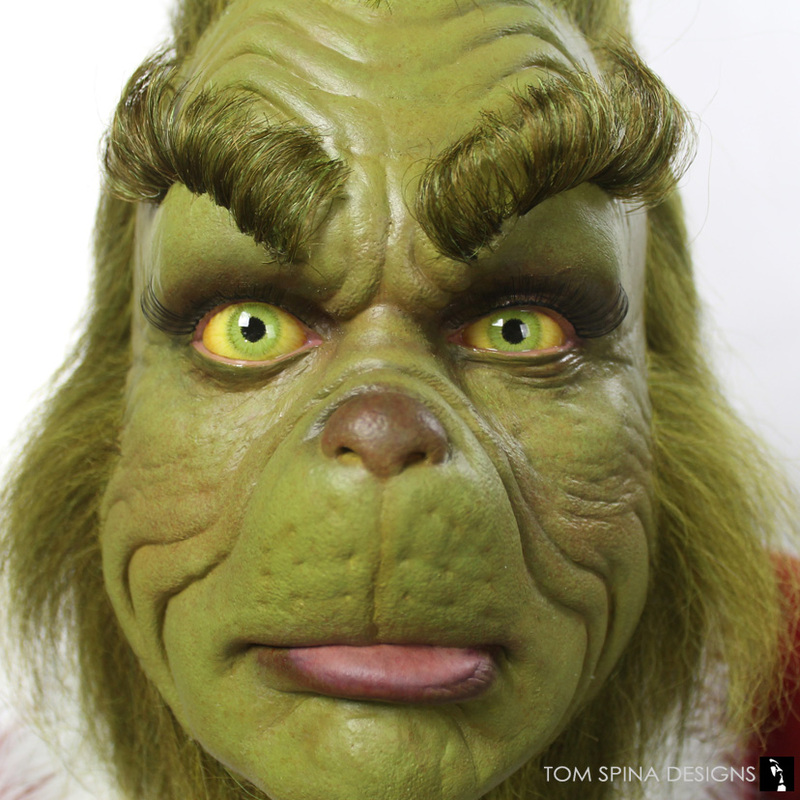 Custom long, curled eye lashes and brows complete this mean one’s look! 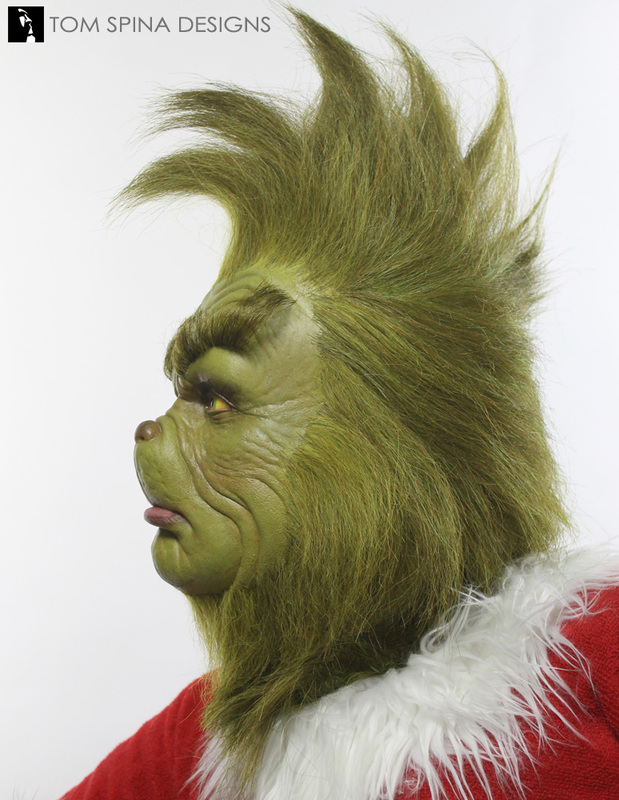 We then moved onto hand laying the custom dyed fur on to the hands and neck to wrap this amazing life sized Grinch bust up in time for Christmas! 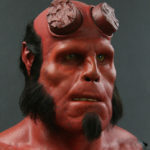 Have an original movie or television prop or mask in need of a unique or themed display bust? 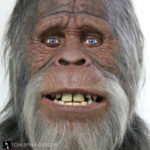 Email or call today and let’s discuss your project! 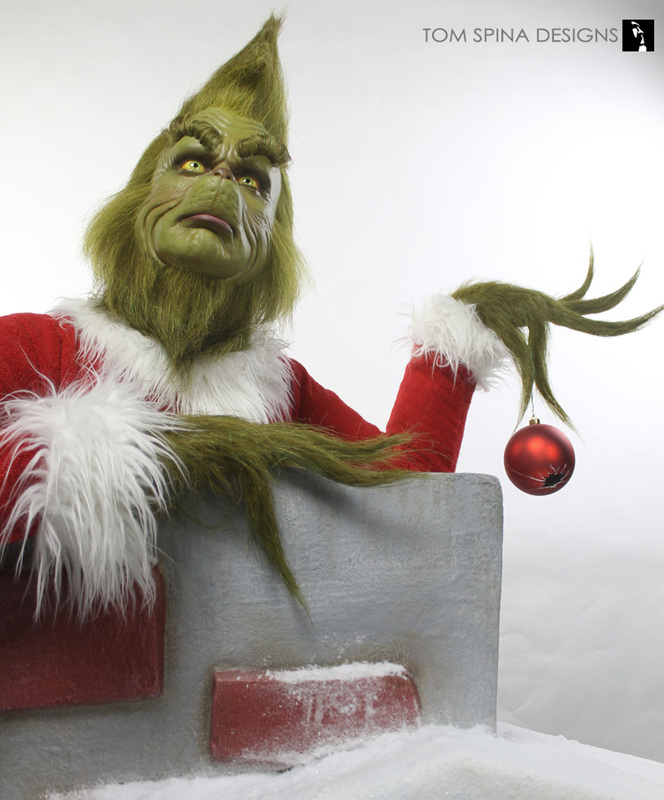 Are you in need of some holiday cheer? 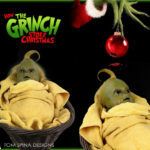 Have no fear, the Grinch is here!